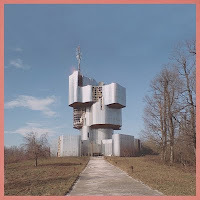 Until yesterday I'd never heard of Unknown Mortal Orchestra but since then I've been listening to their eponymous debut album (released June 21st) pretty much non stop, it's really good! They hail from Portland, Oregon and play a loose style of psych rock which apart from Tame Impala isn't really my usual cup of tea. There are so many intricate grooves and subtle sounds on this album that work so well. The bass on songs such as 'Jello and the Juggernauts' and 'How Can U Luv Me' makes a solid yet at the same time light playful foundation for the overall sound. Every time I listen I hear something new I like. This is a very exciting album. I've booked tickets to see them play at The Lexington in London (promoted by Rockfeedback). I'd love to hear from anyone who's heard them play live - please leave a comment. I'm very excited about this show. They're also supporting The Wave Pictures at The Royal Albert Hall's Elgar Room on July 7th and playing the Lounge on the Farm festival in Kent on July 10th. Yourstru.ly Presents: UMO "How Can You Luv Me" from Yours Truly on Vimeo.